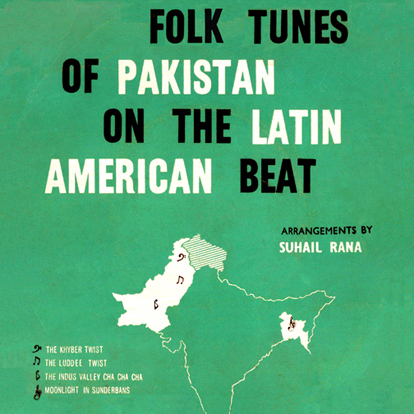 I first came across the Tafo Brothers while working on the Pakistan • Folk and Pop Instrumentals 1966 – 1976 compilation. The master tape for The Blue Birds’ version of “Sun We Bilou Waliya” had been damaged. So, EMI Pakistan sent us the Tafo Brothers’ version instead. The song “Bura Honda Juwariyan Da” can be found on the first volume of Finders Keepers‘ ‘Disposable Music’ series – The Tafo Brothers • Plugged In Pakistani Pops. Also, the song “Karye Pyar” (featuring Nahid Akhtar) – which was sampled by the Wu Tang Clan‘s Ghostface Killah on the track “Black Tequila” – can be found on the Sound of Wonder compilation. 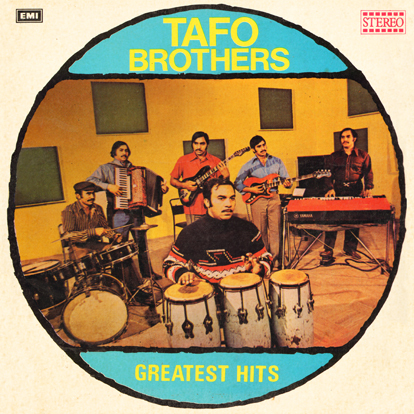 There are five more tracks by the Tafo Brothers on that compilation’s follow up – Life is Dance. There are two albums of their versions of M. Ashraf tunes – Great Love Songs of M. Ashraf Volume 1 Instrumental and M. Ashraf at His Best Instrumental Volume 2 that you can find on most major online digital media outlets. Lastly, there are a number of singles that have been uploaded over at the Hindustani Vinyl blog that are worth checking out. If you have any information about the Tafo Brothers, please contact me or leave a comment. Thanks to Milan Hulsing for his help on this post. Catalog number EMCP-5023 on EMI Pakistan, released 1976. I get asked those questions all the time. Just about every musician from Pakistan that I corresponded with over the last few yeas has asked that. I have always been a big fan of instrumental guitar music. I took – um, I mean borrowed – my mother’s Ventures records when I went away to college. When you add in the cultural influences in Pakistan – being situated between Afghanistan, India and Iran – you end up with a sound that was, and still is, unlike anything heard anywhere else on the planet. 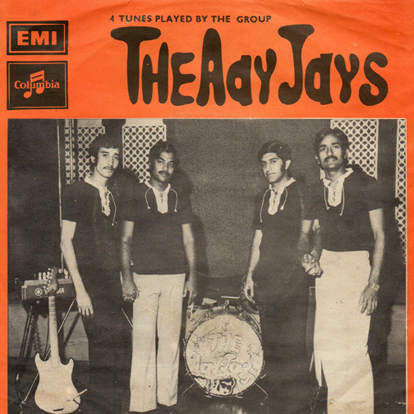 Very little is known about The Aay Jays. This single was the band’s only release. The band was featured on the first two volumes of Pakistan International Airlines‘ In Flight Music series, the second of which included the song “Balley Balley”, which was does not appear on this single. 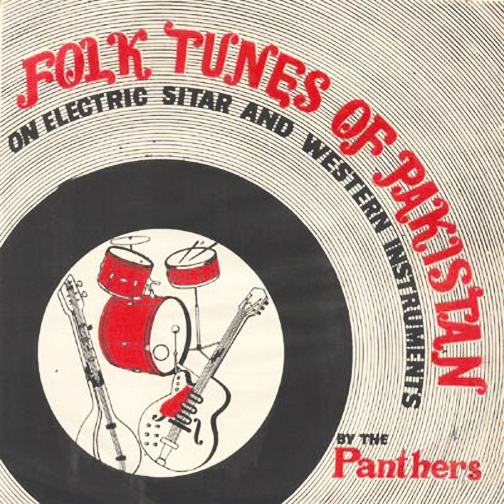 The Aay Jays – as well as The Abstracts, The Blue Birds, The Bugs, The Fore Thoughts, The Mods and The Panthers, Nisar Bazmi and Sohail Rana – are featured on Sublime Frequencies‘ latest release: Pakistan • Folk and Pop Instrumentals 1966 – 1976. The double gatefold LP features 22 tracks, sourced straight from the original EMI Pakistan masters. For information on the record release party, you can go HERE. Many thanks to Marthy Coumans for the vinyl transfer and cover scan of this single. Catalog number EKCE 20023 on EMI Pakistan, released 1973. The history of 60s and 70s Rock and Roll in Pakistan – at least within the focus of this site – is quite brief. The mix of influences that created the music of that time and place are unlike anything to be heard anywhere else on earth. And luckily, just when I think I have found the last piece to the puzzle, another record finds it way into my hands – or, in this case – my e-mail inbox. The first pop song of Pakistan was “Ko Ko Ko Reena” from the Urdu film Armaan in 1966. The song, which was sung by Ahmed Rushdi and composed by Sohail Rana, is a mix of bubblegum pop and Pakistani filmi music. Not too long after, Zulfikar Ali Bhutto’s Socialist Pakistan Peoples Party began a countrywide movement against Ayub Khan’s decade long dictatorship, which he eventually defeated. 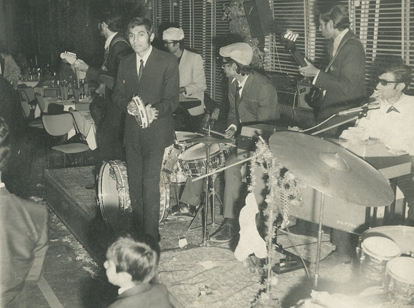 By 1969, bands that were playing American and British pop covers became popular in Karachi’s burgeoning night club scene as well as at hotels and private dance parties. Long hair came into fashion among young men and hashish became popular drug of choice on college campuses across Pakistan. And hippies from America and Europe flocked to Karachi, Lahore and Peshawar. That all ended in June 1977, when Bhutto’s Military Chief General Zia-ul-Haq – backed by the Jamaat-e-Islami – toppled Bhutto in a coup d’état and declared Martial Law. Zia-ul-Haq denounces the Bhutto regime’s “un-Islamic” ways and declares Nizam-e-Mustafa or Sharia law. This marked the end of the “Swinging ‘70s” in Pakistan, as night clubs and alcohol were banned throughout the country. Television and cinema, as well as popular music, were now subjected to government censorship. After the clamp down, most musicians moved away – many moving to America, Canada and England. 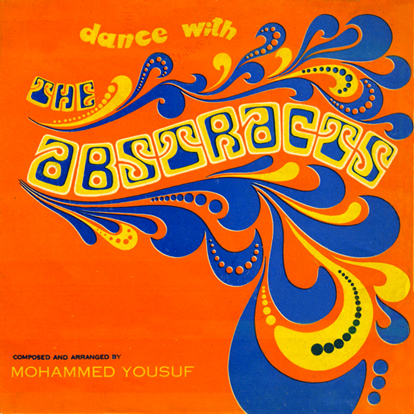 As for The Abstracts, I do know that composer / songwriter Mohammed Yousuf also worked with The Mods. But beyond that, I have not been able to fins anything further information about the band. If anyone has contact information for EMI Pakistan, please get in touch. Many thanks to Milan Hulsing for contributing this selection. Catalog number EMPP 5006 on EMI of Pakistan, released in 1976. When researching the music that is featured on this site, there are usually many more questions than answers. As I type this in an airport in Indonesia – having spent the last four days fruitlessly searching for someone who even knows what a record is – information, even more so than the records themselves, is hard to find. But over the years, I have occasionally heard from a number of the artists that I have written about. In those rare instances, there are moments of clarity and a few more pieces of the puzzle fall into place… Of course they usually ask me, how did you find out about this stuff and why do you care? Back in December of 2008 when I posted a song by The Bugs from Pakistan, the floodgates opened. O.K., that’s a bit of an exaggeration, but I was contacted by a handful of musicians who had been in bands in Pakistan during the late 60s into the early 70s. Two of them – Ahsan Sajjad and Fasahat Hussein Syed – were in The Panthers. Radiodiffusion Internasionaal: Most people don’t realize that Pakistan had such a great scene with quite a few bands. Besides The Bugs, The Fore Thoughts, The Mods, The Slihouettes and The Thunders, do you recall any other bands from that time? Ahsan Sajjad: The bands were The Black Pirates, Talismen, In Crowd, Moonglows and an older band called The Keynotes before the surge. RI: When and where did the band get together? AS: We got together in the year of ‘67 in Karachi. It started with Norman and myself and then we went looking for other members. We had played around with different players but the two of us stuck together. When we released Folk Tunes and had a sit in, Javaid Allahditta, play the sitar we realized we had to go get a sitar player and make him a member. I had known Eric (bass player) for a while and had jammed with him. So I invited him to join us and to switch from lead to bass and then met Fasahat who played the sitar and was versatile on the keyboard. There was the formation of “The Panthers”. RI: Who was in the band, and what instruments did they play? AS: Norman Braganza on lead guitar and vocals, Fasahat Hussein on sitar, keyboard and tabla, Eric Fernandes on bass and Ahsan Sajjad on drums and lead vocals. RI: Which record was recorded first, Folk Tunes of Pakistan on Electric Sitar and Western Instruments or East Goes West? Do you recall which years those records were released? 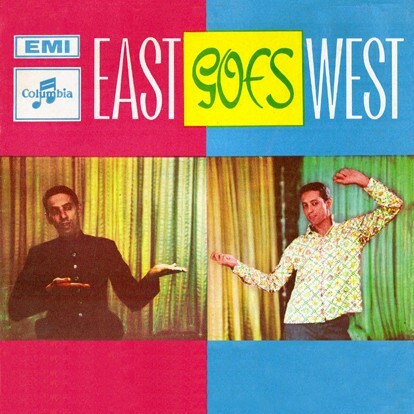 AS: Folk Tunes first and then in June 1969 EMI released East Goes West. East Goes West shows the versatility of the band. This was a well thought out record where local instruments and ragas were utilized as a modern day tune and to show the meeting of the East tunes and West beats/tempo. The bands ability and creativity also comes forth as they employ different beats in sync with the ragas. Sarangi is utilized an instrument that is a very much into the Indo/Pak culture as the intro to each of the three ragas has a very Eastern tone and creates a haunting melody. RI: What type of venues did The Panthers perform in Pakistan? Was there a night club scene? Fasahat Hussein Syed: The first performance of The Panthers was at “Mahapara” outdoors lounge at the swimming pool of Midway Hotel near the airport. We got a contract in the same hotel ballroom afterward. We also played at the Metropolitan Hotel, with some other bands (do not remember the occasion), played at San Patrick’s High School. AS: Venues were limited… So most bands played at house parties and at the limited outlets. RI: I recently saw a copy of The Fore Thoughts first single that was pressed in Iran. Did The Panthers ever perfrom outside of Pakistan? AS: Never made it out of Pakistan. But performed and recorded for Radio Pakistan a tune that was used for their foreign broadcast. The music had to be danceable as that is how the public understood its fancy. But this was also in its infancy and was being perfected as it was being performed or as the target to learn harder songs grew. RI: Fasahat, you said that The Panthers broke up when Ahsan left for America. That’s when you and Eric joined The Black Pirates with Bashir Balouch from The Fore Thoughts. How long were The Black Pirates together? FHS: After Ahsan left for United States, Eric and myself joined The Black Pirates, we played for a fashion show in Metropolitan Hotel, we played at Adamji Auditorium at the Marine Engineers Graduation Party in 1970. I joined the Merchant Marines and left the country, group was broken up. After four years, I signed off from Merchant Marines and joined The Black Pirates again with some new members and played in Horse Shoe Restaurant Lounge on a contract. After the contract expired, group broke up again. I left the group to pursue a Marine Engineering Career and eventually migrated to United States in 1979. RI: What have the members been up to lately? Are you still involved in music? AS: Norman lives in Mississauga, Canada and is very much into Rhythm and Blues, performs guitar and sings at invitational parties and has put out a CD for friends, doing cover tunes. Fasahat plays keyboard and tabla with a fusion band called Tulsi out of Chattanooga, TN. Me, I am still honing my skills on the guitar. Have performed locally at invitations. Very much into Folk/Blues. Working on putting a performing band. Thanks to Ahsan Sajjad and Fasahat Hussein Syed for their help. Catalog number EKCE-20016 on EMI / Columbia Records of Pakistan, released 1969. Where as the music of Bollywood has only just started to break into the mainstream here in The West, the music of Pakistan’s film industry – sometimes referred to as “Lollywood” – is often overlooked. Much like their neighbors in India, the music plays a significant part of the film. After the partition of India, the city of Lahore was the only film production center in the newly-founded Pakistan. The first film was titled Teri Yaad, and was released on August 7th, 1948. Since then, film production studios have been opened in the cities of Karachi and Peshawar. 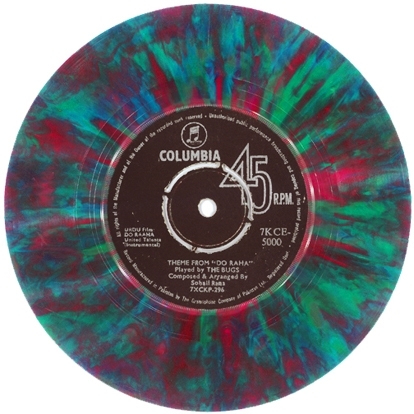 The film Do Raha was originally produced in 1952, and then remade in 1971 with a new score from Sohail Rana – although all of the information that I have been able to find (other than what is printed on the label of this record) says that duo of Sapan Chakraborty and Jagmohan Bakshi scored the film and that the film was supposedly produced in India. The Bugs probably were not a real band. They were most likely a studio creation, that may have even been part of the film. As far as I know, this is there only release – and they are only featured on one side. The flipside is the original version of the theme song from the film. If you any information about the band, please contact me. Catalog number 7KCE-5000 on Columbia Records of Pakistan. No other information available. Thanks for writing and your research into that Era! Indeed those were the most fantastic days of Pakistan when Pakees were not over-dosing on Religion! We did make a couple of recordings at the only record Company then, I forget it’s name (HM something). At that time the only 4/5 star Hotels in Pakistan (InterContinental) opened and they only exclusively engaged foreign bands, mainly from Italy. We were the first local band hired to perform at that chain. We did instrumentals and also songs of that day. Mainly The Beatles, Rolling Stones, The Animals, Creedence Clearwater Revival, The Shadows, The Ventures, Tom Jones, Englebert Humperdink, Gerry & The Pacemakers, The Eagles and some Pakee folk songs / instrumentals. Amazing time we had like Rock Stars. We also travelled to the music and art loving people of that time East Pakistan (now Bangladesh) where we were welcomed like heroes and we had the best time of our music days… We were good friends with late Waheed Murad and others of the film lndustry and all Pakistanis loved and enjoyed our “make-u-dance” music not only foreigners. We had a large following of Swedes, in Lahore. We also performed at Shahbagh Hotel, Flashman’s at Islamabad, Rawalpindi and Faletti’s in Lahore. Sohail Rana (mispelled here as Suhail) was from Pakistan. The name “Pakistan” means “Land of the Pure” in Urdu, as well as in Persian. It was coined in 1934 as “Pakstan” by Choudhary Rahmat Ali, who published it in the pamphlet Now or Never. The name represented, according to Ali, the “thirty million Muslims of PAKSTAN, who live in the five Northern Units of (British) India – Punjab, North-West Frontier Province. (a.k.a. Afghania), Kashmir, Sindh, and Balochistan.” The nation was founded officially as the Dominion of Pakistan in 1947 after the Partition of India, and was renamed the Islamic Republic of Pakistan in 1956. Sohail Rana, who is the son of renowned Urdu poet Rana Akbar Abadi, was born in Agra, Uttar Pradesh province in India, in 1938. After the Partition of India, Sohail Rana’s family moved to Karachi, Pakistan. Like most parents, his father encouraged him to study science. But when Sohail realized that science was not for him, he did not have the courage to talk to his father himself. He approached him through his elder sister to get permission to change over to music. During his primary education, he was admitted to late A.M. Qureshi’s Mary Colaso School in Karachi, where Sohail Rana and future film actor, producer and writer Waheed Murad became friends. Many years later, Waheed Murad’s first film as a producer “Insaan Badalta Hai”, was a success, but he felt that the music fell short of his expectations. For his second production, “Jab Se Dekha Hai Tumhay”, Waheed handed over the task of music to Sohail Rana. In 1966, Sohail Rana came to national attention with the film “Armaan”, for which he won the Nigar award for the best composer for the film. Due to his popularity, EMI also appointed him to compose music for Firdausi Begum and Talat Mehmood. 1970 saw the release of the album, ”Khyber Mail“, for which Sohail received the prestigious Presidential Award of Excellence and the EMI Gold Disc award. He served in the Ministry of Culture as director general from 1976 to 1978 and headed the project of National Orchestra and Choral Ensemble of Pakistan. He also composed music for Pakistan International Airline’s inflight progams. In 1986, the film “Hesaab” was produced, which would be the last of the twenty five films for which he would compose music. Sohail moved to Mississauga, Ontario in Canada in 1990 where he has openned a school for singers and musicians. As of 2005, he was starting to perform live with interactive multi-media and was planning a series of concerts in Toronto involving artists from Pakistan and India. Catalog number EKCF-8 on Columbia Records, manufactured by the Gramaphone Company of Pakistan, Ltd. The Silhouettes were from Pakistan. Apparently, there was a market for traditional music played on Western instruments. Not sure who this was being marketed to, either the indigenous population or foreign tourists. But there were a number of bands that released similar records, most notable being The Fore Thoughts, The Mods and The Panthers. In your hands, is the first ever stereo long playing album recorded and manufactured in Pakistan. We present to you a top, pop local group, ‘THE SILHOUETTES’. These brilliant young contemporary musicians play tunes, some of which are folk, and were written before they were born, in such an original way as to give these melodies a new concept. We have called the L.P. ‘THE SOUND OF THE SILHOUETTES’, mainly because we could not think of a more apt title. You will enjoy listening to the scintillating rhythms, the unique combinations of Guitar and Electric Sitar in SOFT SILHOUETTES and BHAWAIYA, the ingenious blending of vibraphone and Electric Sitar. 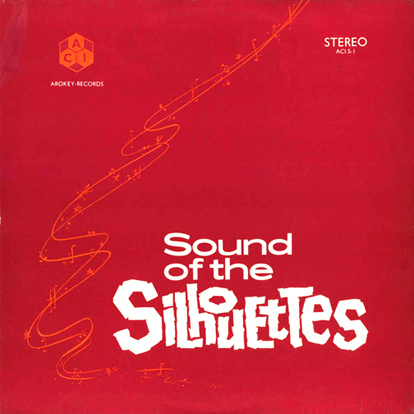 In SOUND OF THE SILHOUETTES, you will also listen to classical numbers like RAGA AMEN and PEELO which they have played with gusto and perfection. Versatility is a strong point of THE SILHOUETTES. In addition to featuring exciting folk tunes, they also make a point of featuring some of their own compositions in meticulous execution. With “MAIN DIVANA” and their great performance of “SOUND OF THE SILHOUETTES” the Silhouettes are sure to become the most popular entertaining group for a long time to come. The Silhouettes did release one other single, as the backing band for Runa and Dina Laila. But as far as I know, that was it. As for their record label, which is the only record I have seen from the region that was not on some version of EMI / HMV / RCA, Arokey Chemical Industries was taken over by the Pakistani government in 1972. Catalog number ACI.S-I on Arokey-Records, “A product of Arokey Chemical Industries, Ltd. 3rd Floor, N.G.B. McLeod Road, Karachi”. No release date listed.